The lack of inventory of homes for sale is one of the most pressing challenges in the housing market today. Existing homes make up most of the nation’s housing supply and the data on existing homes for sale underscores the challenge for home buyers in today’s market. Consider that in its March Existing-Home Sales report published this spring, the National Association of Realtors (NAR) indicated that the inventory of existing-homes for sale has been declining on a year-over-year basis for 22 months. 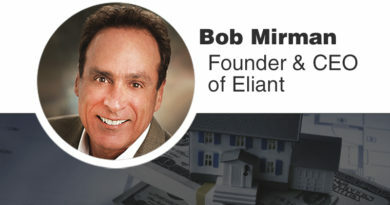 The “months’ supply” metric for housing inventory, which is the number of months it would take to sell all the current homes for sale on the market at the current pace of sales, has consistently remained below four months. In a balanced market, the months’ supply is typically six months. Also, the average number of days a home stays on the market is usually about 90 days, but has been below 80 days since May 2016, according to our seasonal adjustment of Realtor.com data. Historically, the other source of housing supply has been new homes, but new home construction has remained below traditional levels for several years. This is partly due to the fact that the home building industry was one of the hardest hit by the recession. In January 2006, the industry started building 2.3 million housing units. Within three years, new home construction fell to only 490,000 starts in 2009. That’s a dramatic 79 percent decline. Since 2009, housing starts have remained low by traditional measures. The combination of low housing starts and the natural obsolescence of a small portion of the housing stock every year has significantly reduced the supply of homes available to the increasing number of home buyers entering the market over the last three years. The shortage of new housing, combined with the increased demand, is fueling the tight housing markets we see across the country this year. 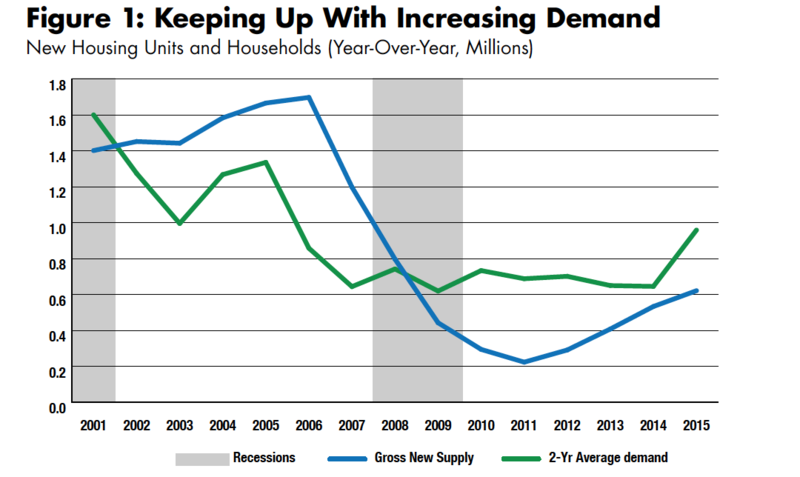 So, why have homebuilders struggled to increase the pace of housing starts to capitalize on the increasing demand? 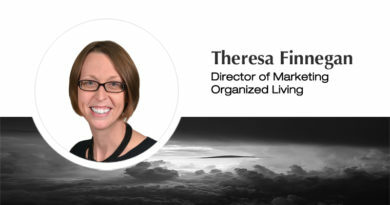 Unlike many industries that are adopting automation, robotics, and artificial intelligence, building a home does not easily lend itself to outsourcing and automation. Home building still requires manual labor as a key input into the production process. While the need for manual labor may be changing or declining in other industries, it’s very hard to build a home without construction workers. According to survey data from the National Association of Home Builders, labor shortages cause home builders to pay higher wages in an attempt to attract labor to their projects, increase home prices making new homes relatively less affordable, delay completion of projects, decline projects, slow the rate of accepting new orders, and make projects unaffordable. Labor shortages increase the cost of home building and slow the development of new housing. Not surprisingly, an increase in the number of people working in residential construction is needed to increase the pace of housing starts. 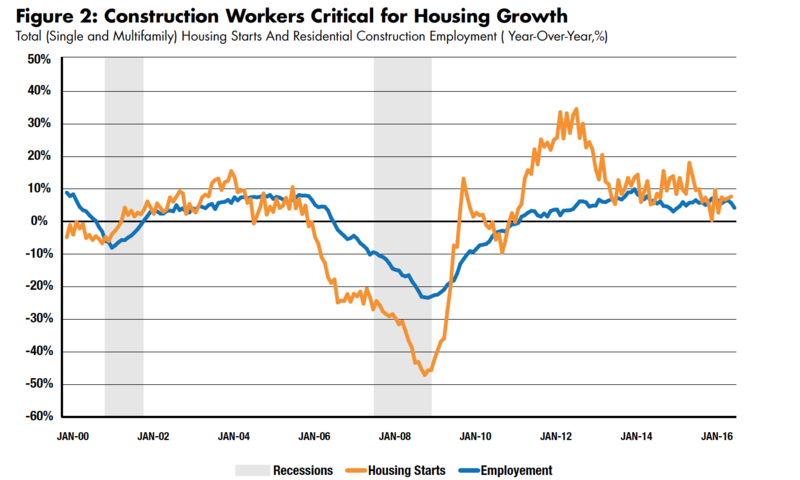 As illustrated in Figure 2, growth in housing starts is strongly correlated with the growth rate of residential construction jobs. During the downturn, the number of residential construction jobs didn’t decline as much as housing starts because labor force utilization, which measures how close to full-time an employee is being used, declined. In other words, employees worked fewer hours, rather than losing the job all together. As housing starts rebounded following the recession, the excess homebuilding capacity represented by these under-utilized workers was absorbed first, before new construction workers were hired. In 2016, the year-over-year pace of residential construction job growth averaged 6 percent and the year-over-year growth in housing starts averaged 8.3 percent. Growth in housing starts and residential construction employment was strongest at the beginning of 2016 and slowed down toward the end of 2016. So far in 2017, the pace of growth in residential construction employment has continued to slow down, which is impacting the growth of housing starts. By studying the relationship between monthly data on housing starts and residential construction jobs since 1985, we created a model that can be used to estimate how much the pace of housing starts will increase or decrease based on the change in the number of residential construction jobs. Based on this model, for every 1,000 new residential construction jobs, we can expect to see a 2,200-unit increase in the pace of housing starts. So, in 2016, about 37,000 new residential construction jobs were created, which implies that the homebuilding industry increased its capacity by 81,400 new housing starts over 2015. Now, let’s look at what has happened over the last decade or so. Residential construction employment reached its peak in April 2006, 11 years ago, at a little over 1 million jobs. In April 2017, residential construction employment reached 763,000 jobs. So, over the last 11 years, residential construction employment has declined by 259,000 jobs, which represents a reduction in homebuilding capacity of 570,000 housing starts. According to the Census Bureau, in March of this year the inventory of new homes for sale was 268,000 units. Those 570,000 additional housing units, double the total national inventory of new homes available in March, would certainly help alleviate the supply shortages that we see in most markets today. The shortage of additional housing supply relative to increasing housing demand has been a chronic problem since the end of the recession and has contributed to some of the strongest sellers’ markets we have seen in recent history in many markets across the country. The challenge of increasing the industry’s capacity to build new homes has been limited by the inability to increase the number of residential construction jobs. Solving for the shortfall in residential construction jobs will be a necessity if we want to catch up – and keep up – with the surging housing demand driven by Millennials hoping for their piece of the American Dream. 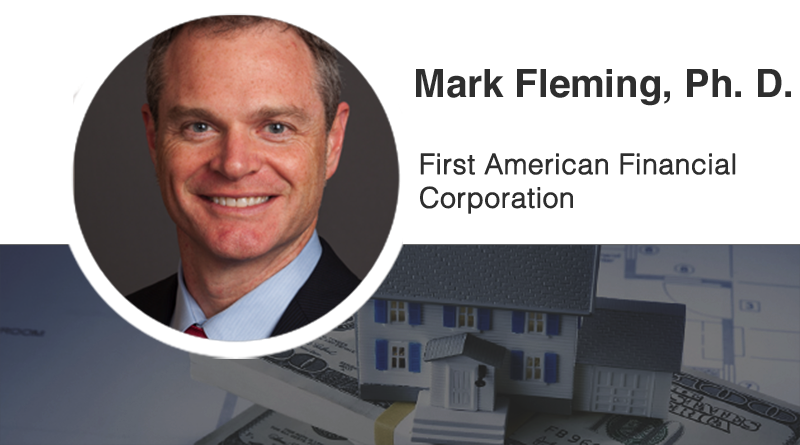 Mark Fleming serves as the chief economist for First American Financial Corporation, a leading provider of title insurance, settlement services and risk solutions for real estate transactions that traces its heritage back to 1889. 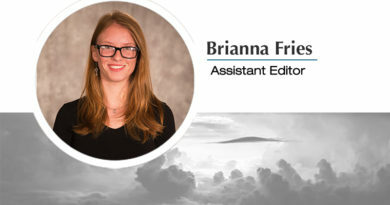 For more information, visit firstam.com.